“Wearing many hats” typically refers to holding multiple jobs. For the game Chalk Gardens, though, to wear many hats means to be emotionally multifaceted, and to literally place a new emotion on your head throughout the day. Chalk Gardens follows a nameless child on a search to find their doll’s missing leg. Players explore rooftops covered in vibrant, childlike drawings you’d find in an elementary school’s playground. While on the quest for the missing legs, the child comes across different obstacles that lead to different paths of progression. Solving a problem requires using a different emotion, or in the game’s case, a different hat. With three hats to choose from, players can tackle problems by being brave, patient, or resourceful. In one scenario, an elephant steals the child’s hat. The lion hat argues to wake up the lion and ask for the hat back. The turtle hat will encourage the player to simply wait for the elephant to give it back, while the owl hat will say to not worry about the stolen hat because there are plenty of other hats to be had. There is no right solution to this conundrum, because in the game, each emotion leads to its own path. In Chalk Gardens, there is no right or wrong way to address a problem. Using emotion as a game mechanic has been used before, but not in the same way Chalk Gardens operates. In Super Princess Peach, for example, Princess Peach navigates each level by using her emotions to problem-solve. Each mood activates a type of ability; for example, if Peach is enraged, she will be engulfed in fire that can burn certain obstacles. If she’s sad, she’ll cry a heavy flow of tears that can water plants. Likewise, in Phoenix Wright: Ace Attorney—Dual Destinies, Athena Cykes is a defense attorney who uses a machine known as the Mood Matrix to determine the emotions clients and criminals are facing. In both games, emotions are absolute. Pick the wrong emotion, and a puzzle won’t be solved, or a criminal may be declared not guilty. But in Chalk Gardens, every emotion always provides a new path to explore. Some solutions may seem wrong, but, as Chalk Gardens argues, there’s something to be learned by that action. 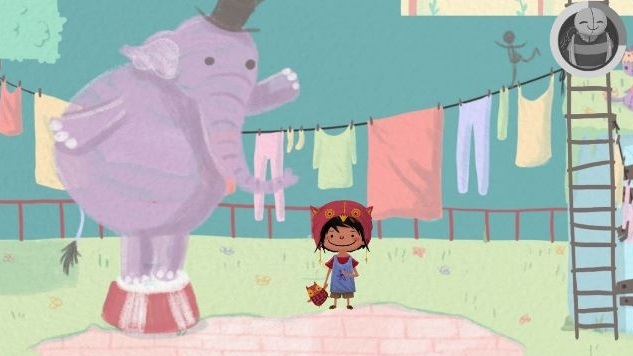 If the child tells the elephant to return the hat, the elephant will not give the hat back, and will instead toss him to a new location to explore. In the end, Chalk Gardens embraces emotions because to feel complex feelings is to be human. In the real world no emotion leads to a dead end; a new path will always reveal itself. When the child returns to his dolly at the end, the search for the missing leg transforms from a simple search for a missing item into a discovery of how to process hardships in life. Its colorful, youthful look makes this a perfect game to give to a child learning about different emotions. But it’s also an amazing game for any adult still trying to figure out what to do with certain emotions. It’s possible to navigate life only with bravery or patience, but life requires you to wear many hats, and to learn from each experience along the way.